The arena building (lower left) at the Virginia State Fairgrounds at Strawberry Hill in Richmond. Wrestling took place here almost every Friday night for decades. 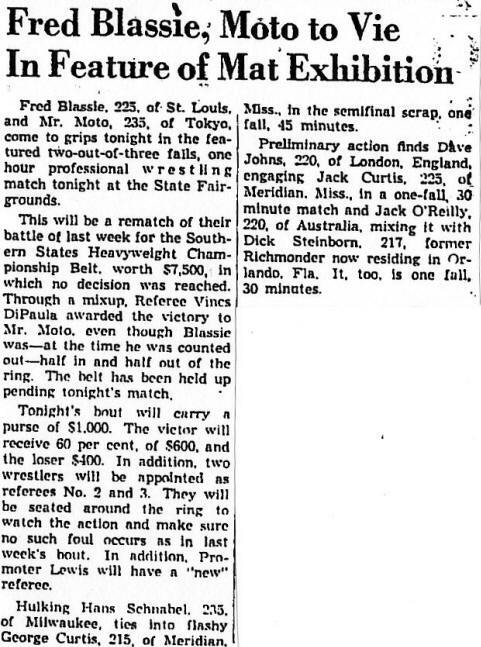 For a generation of Richmond, Virginia professional wrestling fans that stretched back to the infancy of the television age, Friday nights at the State Fairgrounds at Strawberry Hill were where the thrills and spills of All-Star Wrestling, later called Mid-Atlantic Championship Wrestling, would occur. 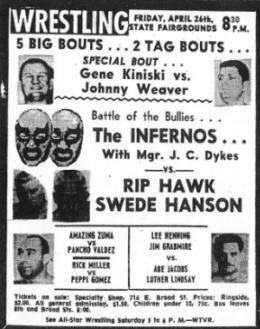 Jim Crockett Promotions (and before him promoter Bill Lewis) promoted many memorable cards, particularly in the late 1950s and 1960s, at the State Fairgrounds in Richmond. In the early part of that time frame, the Fairgrounds were often referred to as the Atlantic Rural Exposition Grounds. 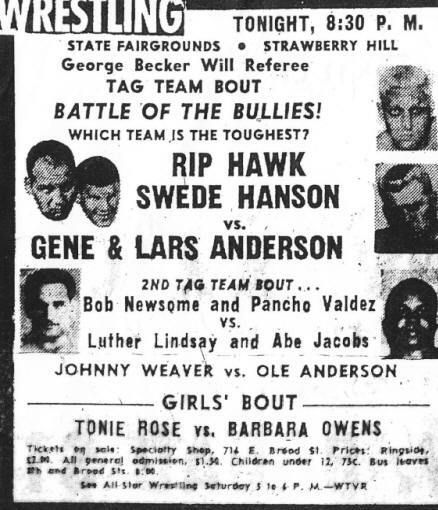 During that time period, the Fairgrounds were the principal venue for professional wrestling in Richmond, although the Fairgrounds are actually located in neighboring Henrico County. 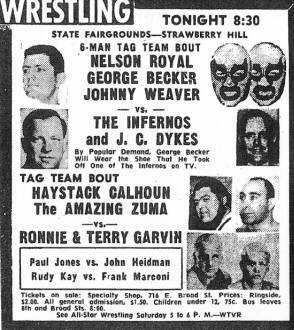 The Fairgrounds venue was a classic “smoke filled room,” smallish and often cramped for all the many fans that wanted to see their television wrestling heroes and villains from Saturday afternoon’s WTVR-TV 6 wrestling show. Richmond’s Fairgrounds had a well deserved reputation for often being a rough and rowdy place when the wrestlers came to town on Friday nights. 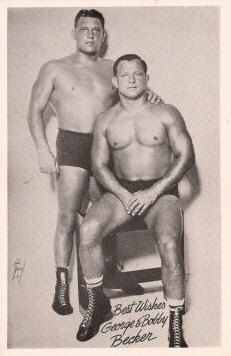 Perhaps the most notorious incident occurred in the mid 1960s when both Boris Malenko and Bob Orton, Sr. were seriously hurt because of fan violence. 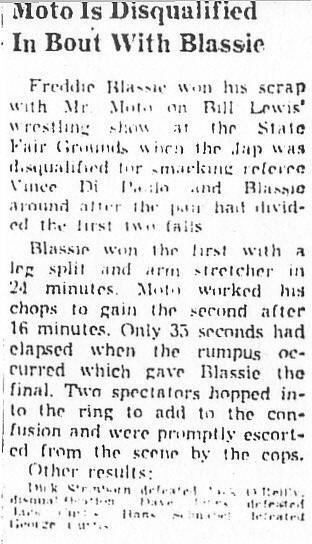 However, numerous wrestlers and managers were also hauled into Henrico County courts for incidents with fans at the Fairgrounds. It could be in a word…wild! In 1971 the cavernous Richmond Coliseum opened, and some of the biggest cards of All-Star Wrestling began being held there. Around that same time, more and more cards were held at the Richmond Arena, and when weather permitted at the Arena’s adjacent ball park, Parker Field. The final professional wrestling card promoted by Jim Crockett Promotions at the State Fairgrounds was held on March 8, 1974. In the last match on that card, Johnny Valentine defeated Jerry Brisco in a Mid-Atlantic Title bout. In an interview with the Mid-Atlantic Gateway, the Super Destroyer (Don Jardine) said he was instrumental around that time in talking the Crockett wrestling office into moving the cards from the cramped confines of the Fairgrounds to the spacious Richmond Coliseum, where more money could be made. 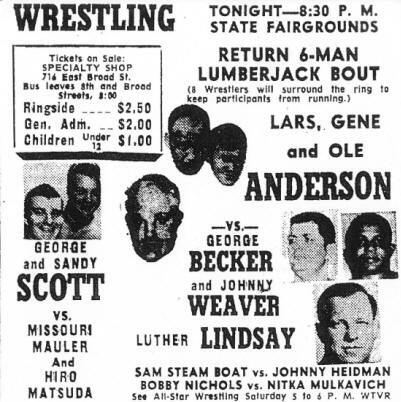 The last professional wrestling matches at the Fairgrounds were held in the summer of 1975, when the International Wrestling Association held several cards in opposition to Jim Crockett Promotions. 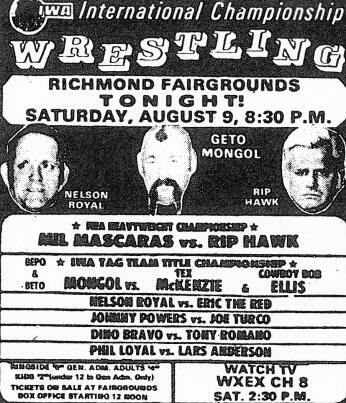 The IWA promoted former Crockett Fairgrounds regulars like Rip Hawk and Nelson Royal at the top of their short lived cards in Richmond. 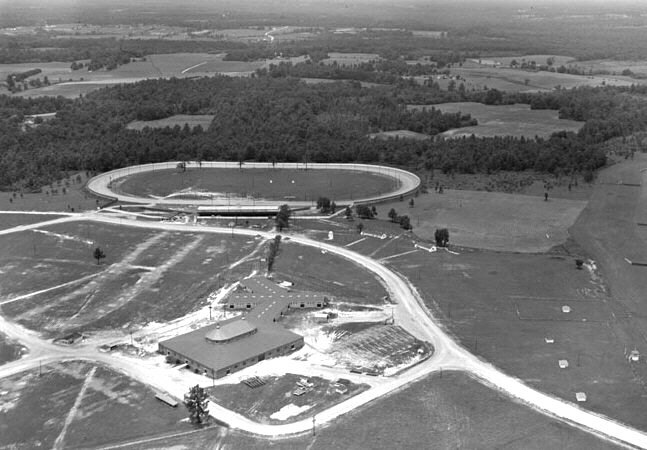 During the time the Fairgrounds housed wrestling, it also served as a parallel venue for horseracing and stock car racing. In fact, the term “Strawberry Hill” reportedly came from boundless strawberries growing on the land involved, prior to the area being turned into race tracks. Horseracing moved from the property in 2000. But to this day, car racing still occurs on this location that is now called Richmond International Raceway, where over 100,000 fans come to each of two NASCAR events every year. Through 2008, the State Fair of Virginia continued to be held at the Strawberry Hill location, normally in late September into early October annually, until being moved north of Richmond into Caroline County in 2009. 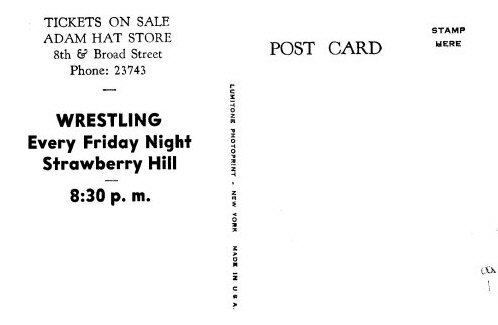 Below is a vintage postcard from the late 1950s: the front included a photo of Bobby and George Becker, the back provided information on where to purchase tickets and info on the weekly wrestling event at Strawberry Hill. Page originally published 11/4/2011. David Chappell article "Strawberry Hill" published 12/1/2011.